Modern listeners can be forgiven for wondering a simple question: how “modern” can a book be when it’s about musical moments generated 50 years ago? But what’s truly amazing is how, all these decades later, music and musicians continually return again and again to the orbit of Jimi Hendrix. And due to that constant, there is continually a new audience drawn to the work of Jimi Hendrix. There have been many, many music releases bearing Jimi’s name issued across numerous estate regimes; accordingly, the Hendrix musical legacy is a remarkably confusing one. Modern Listener Guide: Jimi Hendrix – meticulous, thorough, and entertaining – provides a lively navigation course through Jimi’s remarkable works, pointing the way to the sonic wonders just waiting to be encountered. Understanding those wonders – and how they were created – brings enlightenment. 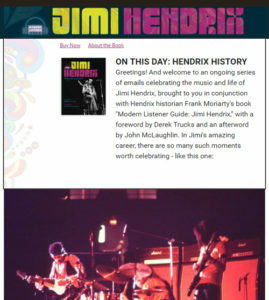 There are plenty of books about Jimi Hendrix as an icon of popular culture. Yet in the wake of Jimi’s brief, mercurial career, these books tend to offer simple platitudes, casually proclaiming various works to be Hendrix masterpieces. But they offer little or no context to communicate why these recordings are masterpieces – and through what means Hendrix realized his musical vision. By contrast, Modern Listener Guide: Jimi Hendrix takes on its subject in a way that has not been successfully accomplished, resulting in a detailed guide to Jimi’s music based on insight and perceptive analysis. Of course, going in-depth can also be a trap. Scholarly works on music can be weighty and dry, squeezing the very spirit out of the musical notes they seek to describe. To avoid that, author Frank Moriarty knew two things were necessary – to have these words about music convey a sense of fun and excitement about the creativity at the heart of Jimi Hendrix’s music, while at the same time building on a framework that provides forward momentum. It was clear this was more an opportunity than a challenge: to address the music of Jimi Hendrix in a largely chronological fashion, with the sounds hosted in a vivid, up-to-date and historically accurate narrative revealing and celebrating the life and career of Jimi Hendrix. In the end, Modern Listener Guide: Jimi Hendrix is an unequivocal portrait of the life of Jimi Hendrix – both the events of that life, and the towering musical works marking that life, resonating to this day and far into the future.